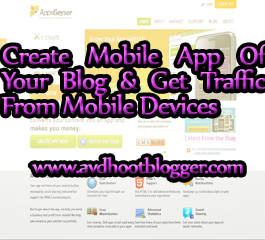 3 Tools To create Windows, Android and Apple IOS mobile apps of blogger blog. Blogging tips To get traffic from Mobiles. If you are using phones with operating systems like Android, Windows, Apple IOS, Blackberry or Samsung you had seen many of apps based to promote website or blog. When you use those they redirect you to their website for further use of those apps. So the questions are how they create such mobile apps. Well there are lots of tutorials on the internet for how to create mobile apps for a website but very few for blogger blog. So today's post is written for blogger blog. How can we create mobile apps for blogger blog. Well below are some blogging tips and online tools to create mobile apps for blogger blog. And they will be accessible through above mentioned mobile phones. Below is the list of some website that creates mobile apps for blogger blog. Appsgeyser has some good feature like it converts all of your content into an app and also allows you to make money from your apps. It Gives Lots of features like messaging, social sharing with full support of HTML 5. Andromo is an android app maker and needs no knowledge of coding required, apps made by andromo are faster, efficient and good looking. Reputed Website Lots of recommendations from Techcrunch, TNW, VB and many others. Joemobi has some of the very best Mobile apps already in the market.Good one for creating mobile apps. Description : 3 Tools To create Windows, Android and Apple IOS mobile apps of blogger blog. Blogging tips To get traffic from Mobiles.